Beautiful Catskills and big backpacks. The Devil’s Path trail in the Catskills is quite an undertaking in its entirety – 24.2 miles over six peaks following red blazes with over 18,000 feet of cumulative elevation gain. The terrain is typical of the northeast – extremely rocky at points, plenty of scrambling, and the occasional gothic-looking pine forest. I thoroughly enjoyed staring at mini-ecosystems exploding from fallen trees and keeping my eyes out for chimneys and escarpments that made me regret leaving my climbing shoes at home. Our plan was to complete the eastern half of Devil’s Path Saturday using a base camp mid-trip, and head home Sunday. This itinerary meant summiting four peaks, five if both of Twin Mountain’s summits count, over 13 miles and 4,000’ of elevation gain. Our group arrived at the Devil’s Tombstone State Campground parking lot just after 4pm. We left my car there, and drove our second car to the Prediger Road trailhead. We set out on the trail around 4:30pm, later than anticipated, for the Devil’s Kitchen lean-to or any established campsite we could find within 3-4 miles of our starting point. Our little posse ended up summiting Indian Head (3,573’) 4 miles into the hike after unintentionally passing the lean-to. As with most other trips I’ve been on, things rarely go as planned, and we finally found flat land with an established site at the Jimmy Dolan Notch just before nightfall. We’d hiked 5.6 miles and summited one of the four mountains we’d intended to do the next day. Water was extremely difficult to find along the way – we didn’t find a single source on the trail. We found flat land near Jimmy Dolan Notch as the sun was setting, and too the Notch trail south to find a cooking sport for the night. Thankfully, we also discovered a water source (puddle). We set out early from Jimmy Dolan Notch and summited Twin Mountain (3640’), Sugarloaf Mountain (3,800), and Plateau Mountain (3840’), a total overall elevation gain of just over 4,000’ between the ascents and descents. The weather was perfect, and the views from Twin Mountain were breathtaking. There was no view from Sugarloaf, and the only way to tell you’ve reached the summit is when you realized you’re starting the descent. The entire trail was engulfed in life – trees, moss, lichens, flowers – and was some of the most enjoyable hiking I’ve done. In order to make sure everyone in the group didn’t overdo it, we ended up going much slower than I thought we would. Between the frequent rest breaks and pace, by the time we all reached the end of the trail at the parking lot, where we’d left my car, it was nearly 6:30 pm. This left us less than two hours to shuttle all of us 13 miles back to the Prediger Road trailhead and ascend back up to the Notch and our campsite. Then it started to rain. It always seems when it rains on a hike or a backpacking trip, it really rains. The rain was relentless, turning the forest floor into a swamp and the trail into a series of waterfalls. The clouds and impending nightfall made some of the blue Jimmy Dolan Notch Trail blazes hard to see. Thank goodness the Catskills trails are notoriously well-marked. We made it back to camp as night was descending, completely soaked. I was nervous – Dan and I were unable to find a suitable, affordable replacement for his leaky tent. We’d taken precautions, which included putting a tarp under the tent to prevent water from leaking in through the floor, and a tarp over it to help with the leaky fly. Our makeshift groundsheet was a few inches smaller than the tent footprint, but we figured it would be enough. We were mostly right. We woke around 9am to one of the most wonderful, morale-building smells one can ever encounter on a camping trip – a campfire. One very talented member of the group managed to start a fire the next morning, despite how completely soaked everything was. Breakfast tasted like heaven and the rain had stopped. We hiked two miles down the Jimmy Dolan Notch Trail to our cars, arriving in the parking lot just after 2pm. I discovered over 30 mosquito and black fly bites on my legs. One of my favorite parts about backpacking trips is spending time in the small nearby towns. I’ll never forget sharing shots of whiskey with new friends at the Newcomb House deep in the Adirondacks last summer, or the incredible enchiladas verde I had at Pancho Villa’s in Tannersville that day. 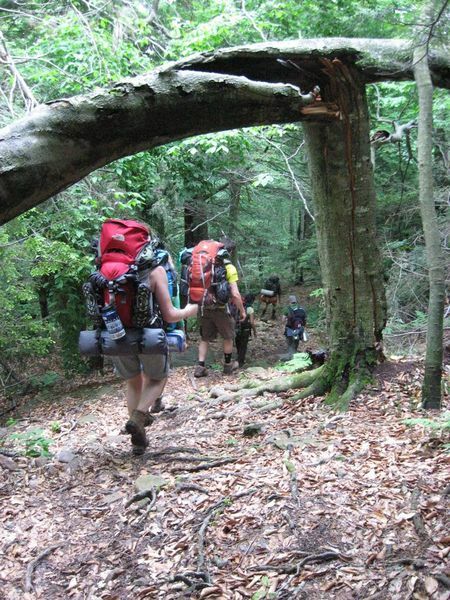 Have you backpacked Devil's Path, or had similar experiences with large groups? Leave a comment! When I hiked "Devil's in a day" two years ago, we also got rained on. An hour of intense thunderstorms near Cove Road. I love that little cabin at the end, don't you? This fall I am thinking of linking Devil's with the Escarpment Trail - now THAT would be along hike.